The Society will join with members of the International Philippine Philatelic Society for a meeting at the BALPEX 2019 Show, being held from August 30th through September 1st. The show will be located in the Hunt Valley Inn, 245 Shawan Road, Hunt Valley, Maryland. The Society will join with members of the International Philippine Philatelic Society for a meeting at the NAPEX 2019 Show, being held from June 7th through the 9th. The show will be located in the Hilton McLean Tysons Corner, 7920 Jones Branch Drive, in McLean, Virginia. Over 80 dealers expected to be at this year's event with a variety of choice philatelic material. The joint meeting with the International Philippine Philatelic Society will be held on June 8th at 1:00 pm and will feature a presentation by Dr. Erwin Tiongson titled "Philippine President Quezon in the White House During World War II". We encourage our members and friends to attend. The Society will join with members of the International Philippine Philatelic Society for a meeting at the WESTPEX 2019 Stamp Show, being held from April 26th through the 28th. The show will be located in the beautiful San Francisco Airport Marriott Waterfront at 1800 Old Bayshore Highway in the San Francisco suburb of Burlingame. This will the 59th annual WESTPEX Show and will feature hundreds of pages of material on exhibition, as well as dealers from around the world. This year's WESTPEX will host several societies, among them being our friends of the Ryukyu Philatelic Specialist Society, the Hawaiian Philatelic Society, and the Canal Zone Study Group. Visitors will be certain to view many items of philatelic importance in the exhibit displays. The joint meeting with the International Philippine Philatelic Society will be held on April 27th from 12:00 noon to 2:00 pm in the Newport Beach Room, and will include a presentation by Don Peterson on "Proofs of the Spanish Philippines, 1871-1898”. We encourage our members and friends to attend. A great event! The USPPS had a joint table with the International Philippine Philatelic Society at the AmeriStamp Expo 2019 show, which ran from February 15th through February 17th, 2019. 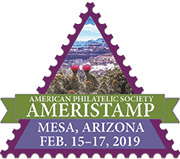 Held in conjunction with the World Series of Philately ARIPEX show, this major philatelic event occurred at the Mesa Convention Center, in Mesa, Arizona. The USPPS and the IPPS held a joint meeting on Saturday the 16th, which featured a talk on "Guam and the Commonwealth of the Northern Mariana Islands" by former USPPS Director William Woytowich. As reported by the APS, "AmeriStamp Expo focuses on single frame and non-traditional types of exhibits and features the annual Single Frame Champion of Champions and the Most Popular Champion of Champions". 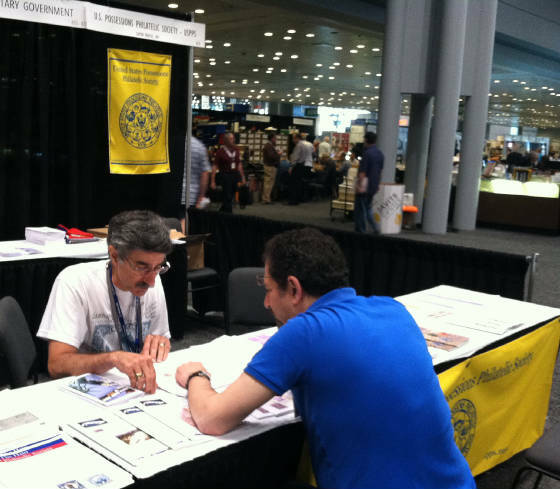 The USPPS had a joint table with the Cuban Philatelic Society of America at the 2019 Sarasota National Stamp Exhibition, a World Series of Philately show, which ran from February 1st through February 3rd, 2019. During the show, the two Societies held a joint meeting for members and friends on Saturday, February 2nd, at 1:00 pm in the "Bay Front Center". The meeting included a program by Juan Farah titled "The Special Design - U.S. Administration Issues for Cuba (Alegorias Cubanas)". This major philatelic show occurred at the Sarasota Municipal Auditorium in Sarasota, Florida. Several stamp societies had representatives at the show and the bourse included thirty-five national and international dealers. The 2018 APS StampShow in Columbus, Ohio was held from August 9th through the 12th at the Greater Columbus Center in downtown Columbus. 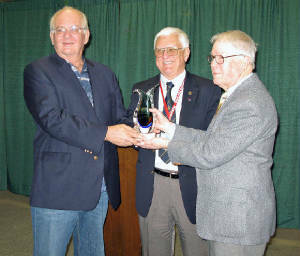 This major philatelic event was quite a show as the result of the APS and the American Topical Show joining forces to present the philatelic event of the year. We shared a society booth with our friends of the International Philippines Philatelic Society and had an opportunity to talk with Society members and other collectors interested in the Possessions. On August 11th, we had a presentation on "Puerto Rico During the Spanish American War 1898-1900" by Bill DiPaolo. Immediately following our meeting, the IPPS held their meeting which included a presentation on "Philippine Booklet Stamps and Panes on Cover during WWII" by Richard Larkin. A great event! The USPPS had a joint table with the Cuban Philatelic Society of America at the Sarasota National Stamp Exhibition from February 2nd through the 4th. The two societies had a joint meeting on Saturday at 2:00 pm in the Bay Front Center of the Sarasota Municipal Auditorium, where Octavio Cabrera gave a talk on “Cuba's UPSS 3b, The allure of the double overprints.” We had copies available of our NY Show Special Issue ("Introduction to Collecting U.S. Possessions’ Stamps and Postal History") as well as Geoff Brewster’s book "Plating the [PI] Legislative Palace Issue of 1926". 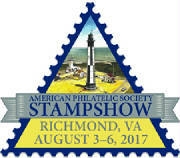 StampShow 2017, the 131st annual convention of the American Philatelic Society, was held in Richmond, Virginia, from August 3rd through August 6th. The 2017 show featured 100+ dealers, societies, live auctions, literature and philatelic exhibits, more than 100 meetings and seminars, and first-day-of-issue ceremonies for new stamps. On Saturday, August 5th, the International Philippines Philatelic Society and the USPPS held a joint meeting from 12:00 noon to 2:00 pm, which included a presentation by Craig Eggleston entitled "Uncle Sam's Post Office in the Philippines, the Initial Year". 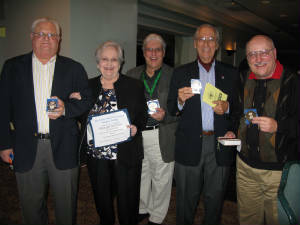 Collectors of Possessions material attending the show also found representatives on hand from the Canal Zone Study Group and the Cuban Philatelic Society of America. As always, this year's event provided a good opportunity to learn more about areas of interest and share in the social aspects of collecting! The Society joined with members of the International Philippine Philatelic Society for a meeting at the WESTPEX 2017 Stamp Show, held from April 28th through the 30th. The show was located in the beautiful San Francisco Airport Marriott Waterfront at 1800 Old Bayshore Highway in the San Francisco suburb of Burlingame. This was the 57th annual WESTPEX Show and featured some 300+ pages of material on exhibition, as well as 75 dealers from around the world. The exhibits included five Philippine exhibits occupying 17 frames by IPPS members James Larot, Richard Miggins, Nestor Nunez (2), and Tommy Sim. The International Philippine Philatelic Society held its Annual Meeting, including the presentation of the IPPS Lifetime Achievement Award to Ron and Barbara (recently deceased) Maineri. The meeting also featured a presentation by Jan Markels entitled "Taal Volcano". Attendees were able to learn more about key Philippine philatelic items during an Exhibitors' Tour of International Philippine Philatelic Society member exhibits on the final day of the show. 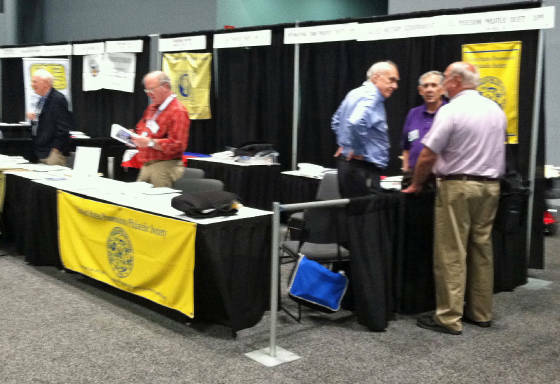 The USPPS had a joint table with the Cuban Philatelic Society of America and the Canal Zone Study Group at the Sarasota National Stamp Exhibition from February 3rd-5th, 2017. The CPSA and USPPS had a joint meeting on Saturday at noon, while the CZSG met at 1:00 pm, both in the Bay Front Center of the Sarasota Municipal Auditorium. The Society had copies available of our NY Show Special Issue ("Introduction to Collecting U.S. Possessions’ Stamps and Postal History") as well as Geoff Brewster’s new book "Plating the [PI] Legislative Palace Issue of 1926". 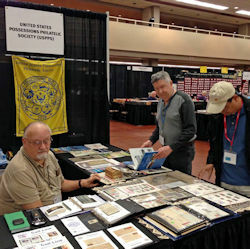 While we did not have a table at APS StampShow 2016 in Portland, Oregon, we had a joint meeting with the International Philippine Philatelic Society where Craig Eggleston gave a talk entitled “1898 U.S. Postal Cards (Philippine Military Postal Stations)” . 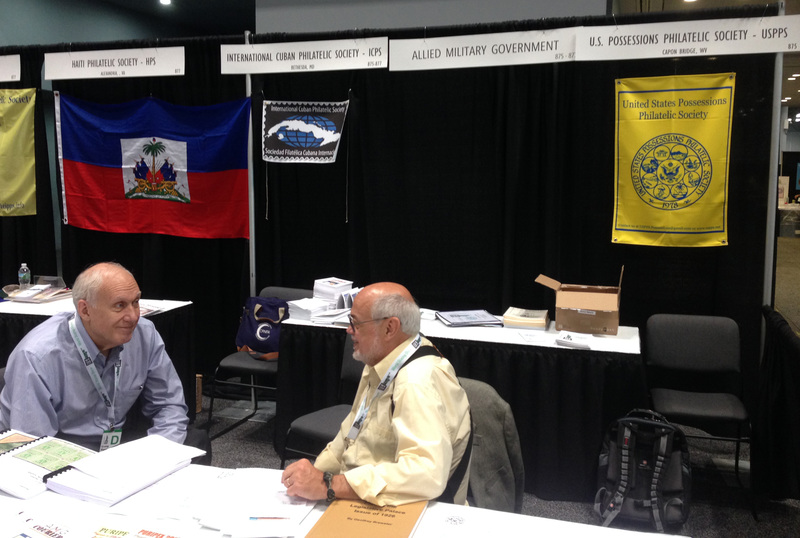 Booths 875/877 at the World Stamp Show in New York were the hub of activities for the USPPS along with the International Philippine Philatelic Society (IPPS), the Allied Military Government Collectors Club (AMGCC), the Haiti Philatelic Society, and the International Cuban Philatelic Society (ICPS). While not listed in the program, we also had literature from the Sociedad Filatélica de Puerto Rico, the Ryúkyú Philatelic Specialist Society and the Hawaiian Philatelic Society. 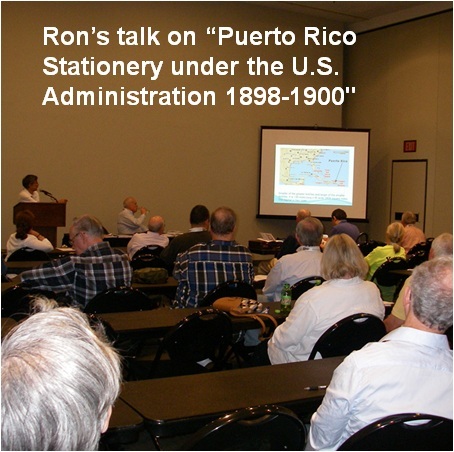 Over 30 people attended the joint USPPS - IPPS meeting on Monday, May 30th, where Dr. Ron González gave a talk on "Puerto Rico Stationery under the U.S. Administration 1898-1900," and Rich Pederson gave a talk on "Collecting Allied Military Government Stamps and Covers." The USPPS had a table and meeting at ARIPEX, which was held February 19th-21st at the Mesa Convention Center, in Mesa, Arizona. The meeting was held Saturday at noon in the Pomeroy Room. USPPS director Bill Woytowich gave a presentation entitled "Guam and Saipan in post WWII Recovery.". 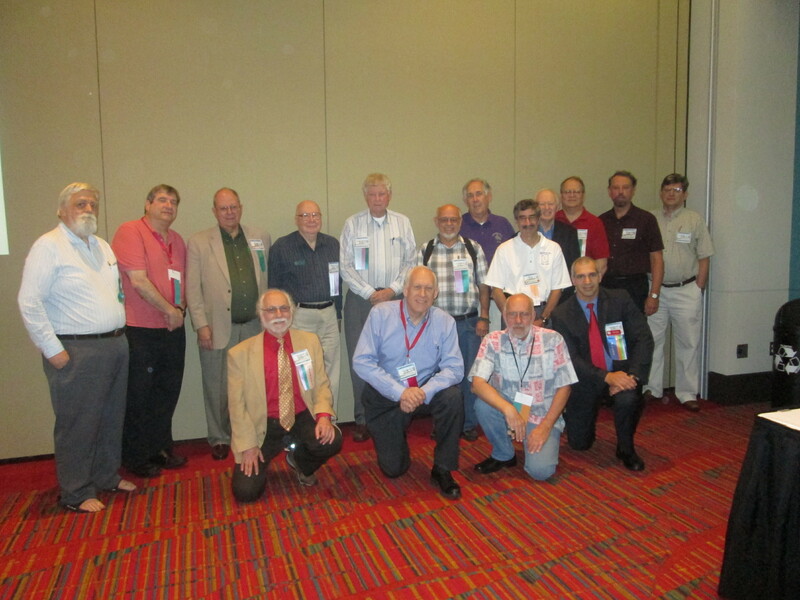 Members attending our meeting at the 2014 Sarasota National Stamp Exhibition. Pictured left to right, Arturo Codina, Len McMaster, Silvia Garcia-Fritos, Alex Blanco, Octavio Cabrera, Ed Carney, Fernando Iglesias, and Cristóbal Martínez. Others attending, but not pictured included Les Lanphear, Richard Livingston, and Phil Stager. The USPPS had a Society table and meeting at ARIPEX 2013, held April 19–21 in Mesa, AZ. At the meeting Geoff Brewster presented several items as part of the "show and tell" format and we briefly discussed the reprint of his Philippine Flights series the Society is releasing on CD. While there were no U.S. possessions competitive exhibits, Geoff had an 11-frame non-competitive exhibit of all the U.S. possessions stamps, an excellent display of our collecting interests. We had several individuals stop and talk to us at our table, signing up seven new members, including James Green (CA), Steve Gross (AZ), Larry Weinstock (OR), John Wynns (AZ), Max Schwartz (TN), Bill Woytowich (AZ), and Jon Krupnick (FL). 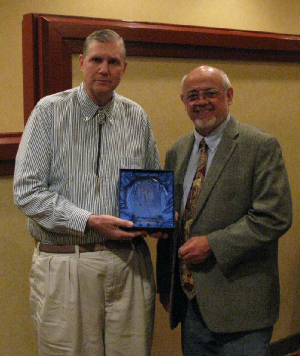 At the ARIPEX awards banquet Saturday evening, I had the honor of presenting Geoff Brewster with a USPPS Lifetime Achievement Award. 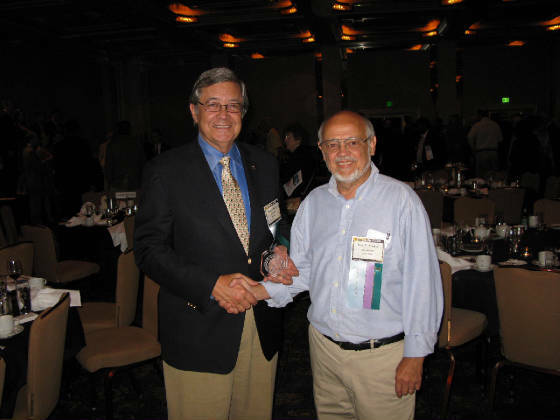 In 1978 Gil Plass started the USPPS by himself, and was editor of our journal, Possessions, for 14 years, 1978–1992, producing Whole Nos. 1–56. Geoff Brewster was appointed our first president by Gil and served 8 years from 1978–1986. 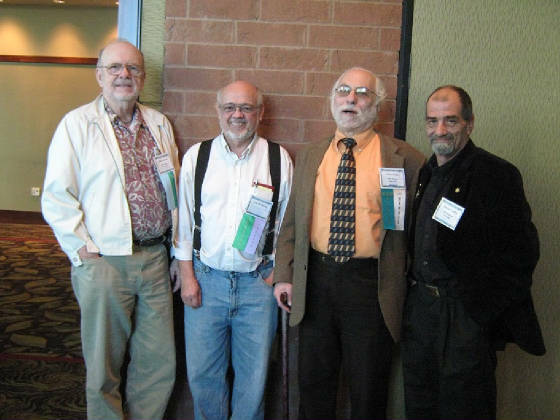 With Gil and Ken Koller, he wrote the USPPS constitution and aggressively promoted our new society, publicizing it in the general philatelic press, arranging for USPPS meetings at stamp shows, and serving as our representative to the APS (Affiliate #99), a position he still holds today. 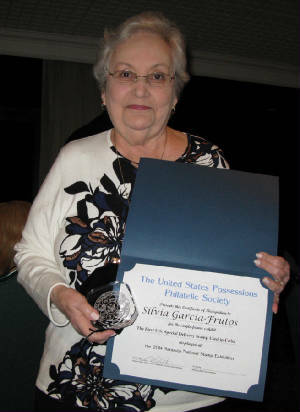 In 2002 Geoff became president again, serving until 2010. He served a total of 16 years as USPPS president, almost half our 34-year existence. Geoff was editor of Possessions for ten years from 1999 to 2010, responsible for 43 Whole Nos. (71–113). Geoff was also vice-president from 1990 to 1994, and served as secretary-treasurer from 2006 to 2010. From 2002 until 2010 he essentially held our organization together single-handedly. 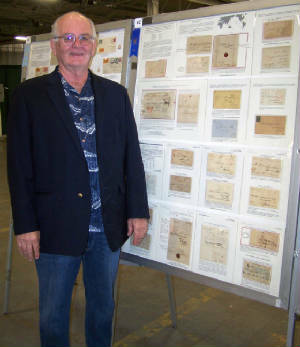 As an author, he has been responsible for more than 200 articles in Possessions alone, making significant contributions to the study of U.S. possession stamps and postal history. 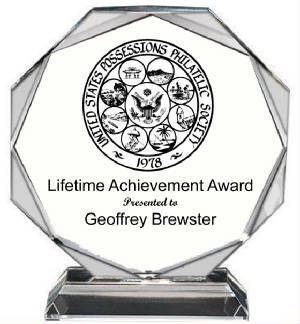 Soon after the show I received the following note from Geoff: "I wish to thank the USPPS for the award it recently gave me, not so much for the item itself—which is certainly attractive and of fine quality—as for the sentiment behind it. I only wish our founder Gilbert N. Plass was still here so that the USPPS could honor him at least similarly, for having firmly established our base and by excellent example having blazed our path for the future." We plan to have a joint table and meeting with the IPPS at the 2013 APS StampShow being held August 8–11, at the Delta Center, 200 West Wisconsin Ave., Milwaukee, WI . Craig Eggleston will give a talk on "American censorship of civilian mail during World War One: new research from the censorship office in Manila" at our meeting. We also hope to present both single- and multi-frame exhibit awards for the best U.S. possessions exhibits. The Sacramento APS show, August 16-19th, 2012 was a great show for us. We had over 20 members and others sign the guest list, and we signed up two new members. We also had several members winning awards. Richard Malmgren: World Series of Philately Prix d'Honneur for his exhibit "Hawaiian Foreign Mail"
Doug Lehmann: Gold for his exhibit "Maintaining the Tax System During the Japanese Occupation of the Philippines (1942–45) with No Paper Imports or Operating Paper Mills Available"
Rick Miggins: Gold for his exhibit "Philippines: 1954–1963 Documentary Overprints on 1947 Internal Revenue Stamps"
Jack Thompson: Gold and USPPS Multi-Frame Award for his exhibit "The Spanish American War and the U.S. Administration in Cuba"
Rick Miggins: Single Frame Grand, Gold, Errors, Freaks & Oddities Collectors Club, United States Postal Stationery Society, and USPPS awards for his exhibit " Philippines: 1948 Embossed Postal Envelope - From Model to Final Die"
At the Philadelphia National Stamp Exhibition (PNSE), in March at the Greater Philadelphia Expo Center in Oaks, Pa., member Richard Malmgren won not only our first award (along with a PNSE gold) for his Hawaii Postal History exhibit, but also won the Postal History Society Award and the PNSE Grand Award. Congratulations to Richard!